Fukushima is at the center right, holding the first-place award. Fukushima Takahiro is the reigning regional champion for Hiroshima. Having earned his title in the Fighter's Road 2012 tournament, he is now one of eight senior class contenders for Japan's 2012 national title. 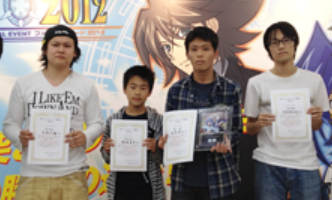 A newcomer to the professional world of Cardfight, this is Fukushima's first appearance in the competitive scene. Fukushima's Gold Paladin deck uses the Incandescent Lion, Blond Ezel ride chain to reach grade 3 ahead of his opponent, taking advantage of Viviane and Ezel's superior call skills to fill the field quickly for Ezel's continuous skill. These cardskills likewise tie into the Sleygal series cards Fukushima employs, allowing him to counterblast repeatedly for additional power to support a combination attack between the two Sleygals, and with Manawydan. Like many paladin builds before it, Fukushima's deck favors two criticals over stand or draw triggers. By pressing the field repeatedly with these 20000-and-above power units while Trip unflips damage, Fukushima is able to maintain field presence with minimal direct calling and low cost while forcing repeated guards from his opponents. With his grade 1 Sagramore, Fukushima sorts out unneeded cards to arrange the perfect field to bring his strategy together, making for a powerful and consistent deck.